Published July 12, 2016 By Anna T. This post may contain affiliate links. Regardless, I only recommend sites I've researched and/or used and trust. If you've been following my blog for any length of time, then you already know that Qmee is one of my favorite online side earners. It's one of the most simple, no-effort-required, opportunities I have listed because all you do is install their Chrome extension, and then search as usual on sites like Google, Amazon, and eBay. During your searching, you'll occasionally see ads appear in the sidebar that you can click on. These typically pay anywhere from 2 to 10 cents when you click. Then, you just watch your money build up over time and cash out your earnings to Paypal anytime you want — even if you only have a penny in your account! Qmee also makes it possible for you to save more money online when you're shopping. In addition to the clickable ads that earn you money, you may occasionally see price comparisons and discount codes you can use while shopping. I've been using Qmee for over a year now and have been paid consistently and promptly during that time. But I've always thought it would be nice if there were a way to make Qmee more lucrative since it can take a while for those cents to build up. And thankfully, they just added a new feature. Introducing Qmee surveys. 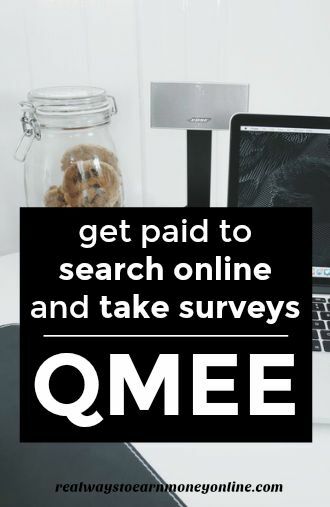 Now while you are doing your usual searching and shopping with Qmee, you might occasionally get a paid survey invitation. Just answer the preliminary questions to see if you qualify to complete the survey. If you qualify, simply answer the survey questions and get paid. These surveys aren't too long and they are usually worth in the neighborhood of 50 cents each. Note that there is no way to make these surveys appear. Just like with the ads and money-saving opportunities, they will only appear on occasion. Another way to earn money with Qmee is via their referral program, which is hands down one of the best I've ever been part of. Qmee will pay you $1 per friend referred on your friend's first cash out. And there is a great chance that the people you refer will use the app and cash out regularly since Qmee makes it all so easy to do, with instant Paypal payments and no annoying minimum cash-out requirements like you see with other sites. If you're ready to try Qmee for the first time, you can sign up here. If you're already part of Qmee and haven't been active in a while, give it a go again to see if you get a survey invitation. Great review Anna. One of the ways I made money from home was by taking surveys. Thanks for telling us about QMEE. Passing this along. Thanks Anna, I got my first 10 cents, I’m always leery about those surveys because they go on forever and you never get paid. I do appreciate this. I’m looking to make a little side money. I’ve been following you on Pinterest and applying for jobs everywhere. You are great, keep up the good work! Yay! Glad you like the blog, and good luck to you!